Remote Sensing in Ecology and Conservation is a new open access journal, addressing the interdisciplinary field that links different aspects of remote sensing (the use of different imaging and sensing technologies) and the field of ecology and conservation. It is publishing its papers in Open Access, so the papers are free to download and share. With the encouragement of the journal editorial team, a group of editors (Helen Roy, Tom August, Linda See, Tanya Berger-Wolf & myself) set out a call for a special issue on citizen science. 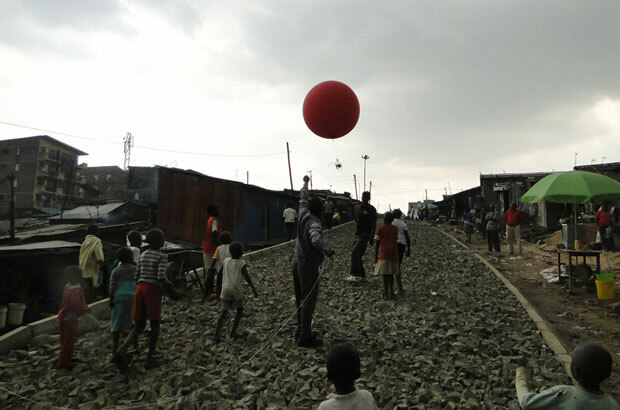 Citizen science is becoming part of the way research in ecology and conservation is now carried out, and there are plenty of examples of the use of remote sensing techniques – from the Do-It-Yourself balloon mapping that you see above, as part of research that explores how human, livestock, and food is linked to an informal settlement in Nairobi, to use of drones by non-professional researchers, to the use of satellite imagery. One of my favourite citizen science project – PenguinWatch – is an example for remote sensing, as it uses camera traps imagery that is then uploaded to the Zooniverse platforms, and volunteers help in counting how many penguins appear in the image. For centuries amateur naturalists have contributed to science; for example, by recording the distribution of species. However, in recent decades, advances in technology have revolutionised “citizen science” and far more people are involved in different ways than was historically the case. We invite high-quality contributions about citizen science to a special issue of Remote Sensing in Ecology and Conservation. The aim is to demonstrate the diversity of citizen science, in terms of approach and research themes, and the contributions of remote-sensing techniques. We are particularly interested in innovative research that identifies the intersection between remote sensing and citizen science for conservation, such as DIY balloon or kite mapping, the use of photo-sharing apps and the integration of satellite observations with ground truth by volunteers. Papers that reveal how citizen science and remote sensing can be used to monitor Essential Biodiversity Variables (EBVs) are also welcome. The main objective is to describe the breadth and depth of engagement that is now possible using different approaches to citizen science. High-quality submissions for this special issue will be considered on a case-to-case basis for a full fee waiver, where authors are unable to pay the Article Processing Fees. Submission deadline 15 July 2017.